Thans to his cunning lawyer, Walker Boone, her ex got everything else, including the Lexus--not to mention a young blonde cupcake. When Reagan finds the blonde dead in the Lexus, she's determined to beat Boone to finding the murderer. As it turns out, the gossip fiends flooding Reagan's shop can give her a lot more than just their unwanted clothes--they have information more precious than a vintage Louis Vuitton..
Story Thoughts: What a freaking romping good time! I seriously giggled for most of Iced Chiffon. This was a case of someone hitting rock bottom and saying I am not going to put up with anymore. If that means finding the real killer to get her ex-louse of a husband out of jail so she can keep her house (the one unresolved item from their divorce) then so be it. While a little bit of it was far-fetched (aren’t all cozies? ), the whole thing read exactly like someone at the end of their rope. I think what I loved most about Iced Chiffon is everyone kept telling her to stop investigating on her own because it was dangerous. She didn’t listen, ended up being a decent tracker of information (though not at all as sly as she thought), and that made it fun. 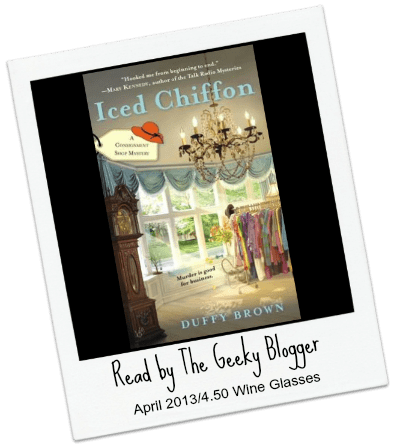 Final Thoughts: If you want something fun for a relaxing afternoon then Iced Chiffon is for you! I read the book last week, and posted my review yesterday. You are right, those characters are fun and I was laughing out loud a few times. I did immediately order the next book, and hope it arrives soon. Oh, yay! I’m so glad you enjoyed it. I’m fixin’ to start book two soon. Love that it’s a Savannah setting. I am reading Jo Davis Sworn to Protect and then I will be starting it. I had 3 books come today (Mothers day gifts from the dogs): Sworn to Protect by Jo Davis, Hex on the Ex by Rochelle Staab, and Killer in Crinoline by Duffy! I audiobooked Sookie! Auntie KiKi is such a fun character, the auntie we all want in out lives. And she’s gutsy always helping Reagan find clues. She’s not one of these Oh you shouldn’t do that, but more Get the keys to Beemer and let’s go! Oh, this sounds like so much fun! I love a good case of the book giggles. This one just cracked me up! Granted I read it towards the end of Dewey’s 24 hour marathon so I may have been slightly delirious but it was FUN! So glad you enjoyed Iced Chiffon, Felicia. Thanks for posting. Thanks, Lucy. If you’ve never been to Savannah you need to visit. I great place to escape to and set a mystery. Lots of fun in Iced Chiffon. Killer in Crinolines comes out today, book two in the Consignment Shop mysteries. Not all weddings are blissful especially if the groom is found face down in his own wedding cake. I love it when you giggle throughout a book! Right there makes me want to read it. I seem to be reading a lot of mystery books and enjoying them lately. Must add this one to the list! Thanks, Felicia. You made my day. Killer in Crinolines is out today, book two in the series. It is a light series but the bond between mom, auntie and daughter/niece makes the book all about family. I pre-ordered it! I am hoping Amazon delivers today and if not then tomorrow. Thank you for the fun, fun world! I love a cute cozy with great characters. I want to meet the old lady. I am doing food cozies this week and so far they have been pretty good. I will have to add this to my list! The Consignment Shop mysteries is set in Savannah so all about family and lots of good Southern cooking. YAY I love a giggle-worthy book! And I always love when there’s a sassy old lady in a book. I wanna be sassy when I’m old (which is approaching faster than I want! ).